December 24, 2015 (Poway) – Sheriff’s deputies responded to an accidental shooting shortly after noon today at the Poway Weapons and Gear shooting range in Poway. July 10, 2015 (Poway) –CAL FIRE announces the arrest of Benjamin Cohen, 44 from Poway. He is suspected of intentionally starting 11 fires in 2012, 2013, 2014 and 2015. April 15, 2014 (Poway)--San Diego County and Poway are teaming up on an ambitious proposal to connect the region’s vast network of hiking and equestrian trails and other popular outdoor attractions. March 15, 2015 (San Diego's East County) -- Spring is a time of fresh beginnings. Flowers are blooming, birds are chirping, new animals are being born. For local seniors in wheelchairs or using canes or walkers, it'll be an opportunity to decorate their largest accessory and celebrate life. January 7, 2015 (Poway)-- Members of the business community are invited to attend the Poway Chamber of Commerce’s monthly Mixer held at Mt. Olive Church & Preschool, 14280 Poway Rd, Poway. The Mixer will take place on Thursday, January 22 from 5:30 -7:30PM. Light refreshments and drinks will be available. September 19, 2014 (Poway)—From Vegas to Atlantic City, Sharon Owens has performed her “Tribute to Barbra Streisand.” The singer has an uncanny resemblance to the famed singer as well as a vocal talent that has made her a sought-after Streisand impersonator. She will perform September 28 at 2 p.m. at the Poway Center for the Performing Arts. November 17, 2013 (Ramona) – A Ramona resident and a transient have been arrested for the attempted murder of a San Diego Police officer in Poway last night after shots were fired during a traffic stop. 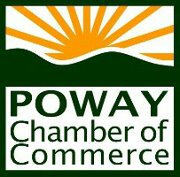 September 26, 2013 (Poway) –The Poway Chamber of Commerce will host a Lunch and Learn on Wednesday, October 9 from 11:30 a.m.-1:00p.m. It will feature a presentation by Jack Cohen of Insperity. Cohen will discuss health care reform, what it is, and how it will impact your business. He will cover five key areas: (1) Individual Mandate; (2)Taxes/ Fees/Costs; (3) State Exchanges; (4) Employer Share (Play or Pay); and (5) Reporting. August 28, 2013 – The fall series of the San Diego County Library Acoustic Showcase begins in September with 3 East County concerts throughout the month. The Showcase series offers a variety of San Diego’s best singer/songwriters, folk music performers and story tellers. The concerts are free to the community. June 23, 2013 (Poway) – Evelyn Jean Courtney, 19, a has been identified by the County Medical Examiner as the victim killed when the vehicle in which she was a passenger was struck by a fire engine en route to an emergency medical call. Courtney, an aspiring model, was wearing her seatbelt when the fire engine broadsided the vehicle in which she was riding on June 20, 2013 at 4 a.m. in the intersection of Poway Road and Midland Road in Poway. She had attended Poway High School and Mt. Carmel High School, according to 10 News. She was single and lived with her parents. April 23, 2013 (Poway) -- Members of the business community are invited to attend the Poway Chamber of Commerce’s monthly Mixer at Business Copier Solutions at 13750 Danielson Street, Poway, CA 92064 on Thursday, April 25, 2013 from 5:30 -7:30pm. Free refreshments and entertainment will be provided and a Ribbon Cutting Ceremony will be held during the Mixer. Business Copier Solutions will also host an Open House from 1:00 to 7:30pm. During the open house, a surprise Padres Player will be on-hand for pictures and autographs. Attendees will also have the chance to enter opportunity drawings. February 10, 2013 (Poway) – A 12-year-old student at Twin Peaks Middle School has been arrested after sending an e-mail to an administrator Friday night threatening to shoot 23 students and a teacher at the school on Monday, February 11. According to the San Diego County Sheriff's department, the e-mail also claimed the student had access to numerous firearms and 3,000 rounds of ammunition. Yesterday, a search of the student’s home found numerous rifles and handguns along with computers, ECM news partner 10 News reports. February, 8 2013 (San Diego)--Police agencies all over the state of California are on high alert. The manhunt for Christopher Dorner, 33, a former Los Angeles police officer wanted for three murders in the L.A. area, has spanned multiple counties including San Diego. Citizens across Southern California are asked to not engage and call 911. Dorner is considered extremely dangerous and well armed. He has threatened additional violence and released a manifesto accusing L.A. Police Department of corruption, other misconduct as well as wrongful firing. ECM news partner 10 News has an edited copy of it, with names removed. November 1, 2012 (Poway)—A hiker who collapsed on a trail on the Poway side of Mount Woodson has been declared dead, Lt. J.T. Faulkner with the San Diego Sheriff’s office informed ECM. A friend who was hiking with the victim called for help at 11:04 a.m. “Our unit got there at 11:14 and the Fire Department was already there,” Lt. Faulkner told ECM. The victim was found about halfway up a trail. Copter 12 and ASTREA were called in to assist.